Logan Peters grew up on a small, diversified family operation. He spent a lot of time following around his dad and grandpa as a young boy and bought his first bucket calf when he was 8 years old for $210.00. This is what sparked his love of beef cattle. He wanted to start his own herd of beef cattle. Knowing the slow process to grow a cattle herd internally, as well as the capital required to purchase bred cows to expand his operation, Peters began brainstorming ways to support and grow his herd through value-added profits. In his free time, he started a lawn mowing business, picked up scrap metal, raised chickens for both meat and egg production, put together field corn test plots and helped neighboring farmers. Pumpkins were his next big venture. After much research and limited land, he decided to try it and produced 700 pumpkins in his first year. He learned quickly how to grow, store and market this seasonal product and eventually would sign a contract with a Papillion shopping mall to supply fall decorations, including pumpkins, gourds, straw bales, cornstalks and ornamental corn. All the profit from these ventures went to support his dream of growing his cattle herd. And grow it he did. He purchased fifteen Wagyu bred cows at the local sale barn. While the purchase doubled his herd size, it also created more challenges. He needed to find a more profitable way to market because there is such a niche market for the Wagyu breed. Wagyu is a Japanese breed of cattle known for the extreme amount of marbling found in the meat. He wanted to sell these cattle privately, so Peters listed his calves for sale on Craigslist and he began conversations with Jill and Mark Schmitz of Panama, Iowa. Mark, a former Ag Ed teacher and FFA advisor, became a mentor and buyer of Peters’ calves. Schmitz would finish the cattle and distribute the meat to local restaurants and sell it online and in the wholesale market. This relationship eventually gave Peters the opportunity to purchase purebred Wagyu bulls from Schmitz. Peters says he learned a lot because of his agricultural education classes, supervised agricultural experience (SAE) and FFA. He credits his leadership skills to his time as a chapter officer and the leadership development activities he participated in during high school. The skills he learned in classes and the Career Development Events he participated in have been very relevant to his college coursework and day-to-day aspects of his operation. He shared a story of a bad snowstorm near his hometown where he lost three calves in ten days. 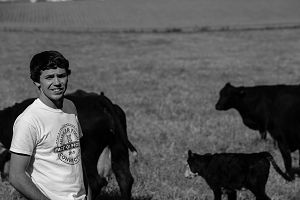 “I was irritated and frustrated,” Peters said, “but it taught me to take more ownership of my herd.” He began to pay more attention to and make his own decisions regarding vaccinations, feedstuff and the layout of the cattle yard to be better prepared for severe weather. Peters says he’s always had the entrepreneurial spirit. When he was eight years old, he started Logan’s Corn Palace. He says, “I was riding in the combine with my dad, saw corn left in the field and started asking questions about the waste.” He began picking up ears of corn left lying on the ground, designing and building squirrel feeders and learning to market these products to local customers. Peters says he attended Nebraska’s FFA Convention with his parents when he was in Junior High. His older brother was involved in FFA. It was seeing the Stars Over Nebraska Pageant on stage that he set a goal of becoming the State Star Farmer. As a senior, he wasn’t even selected as a state finalist for the award, but he didn’t give up. Peters waited a few years to develop more of his SAE, narrowed his focus to premium alfalfa hay and Wagyu beef cattle production and applied for the American Star Farmer as part of the American FFA Degree. Considered as the highest recognition in the nation for an aspiring young farmer, the American Star Farmer Award recognizes achievement in both career and leadership development. He was chosen as a finalist, meaning Peters was in the top four in the nation. But his story doesn’t end there. Peters, a senior at the University of Nebraska-Lincoln, will graduate and continue to grow his operation. He has done thorough research and written a business plan for PrimeFire Meats. “I realized early on in my high school career that there wasn’t going to be an opportunity for me to come back to the family farm and I decided to create an opportunity myself,” he says. His plan includes vertically integrating his SAE into a birth to plate operation. This means he will finish out the cattle himself, get them processed at a specialty packing plant, utilize cold storage and sell American Style Kobe Beef directly to high-end restaurants all across the Midwest.